How are your May weekends looking? If you have some free time and are looking for inspiration here are a few upcoming May events that might be of interest to you. 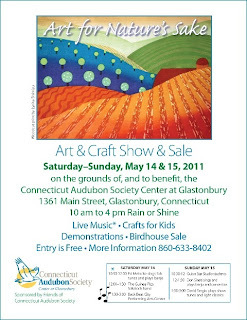 This is a juried art and craft show combined with musical entertainment to benefit the Connecticut Audubon Society in Glastonbury, CT this coming weekend, May 14 & 15th. You can get more information here. Lynita Shimizu designed the woodcut on the poster and sent me the information. I have blogged previously about Lynita's beautiful woodcuts here. A colleague of mine has an on going cooperative art and craft show in her barn in West Woodstock, CT. Artists in the Country showcases the work of 12 people from the Quiet Corner. It is held for 6 weekends from April 16th through May 22nd. They have been holding these collaborative events for a number of years in both the spring and the fall. 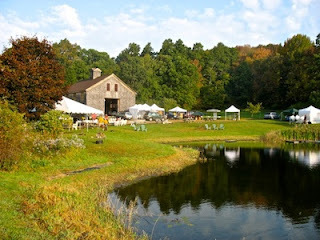 And the big May event is held at the end of the month in Northampton, MA. Paradise City puts on a series of premiere craft events in Southern New England. This one has 250 craftspeople together at the 3-County fairground. It is held Memorial Day Weekend on May 28,29, 30th. There is an admission charge but you can get a $2 off coupon at their website here. 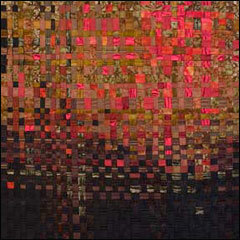 Woven Silk strips colored by batiking by Corrine Seeley. I have to admit that yard work calls loudly on May weekends but I still will try to squeeze in a craft show or two. How about you?